In this experience, students learn the key characteristics of a personal narrative. They read an example of a personal narrative and then analyze how the personality of the author is shown and what changes he undergoes. Finally, they connect to the story by writing a letter to the narrator. 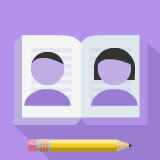 Identify personality traits of the main character. Identify the changes undergone by characters in the narrative. One or two class periods. You may choose to have the students read the personal narrative at home before beginning the experience. Authors may choose to write about many different topics. Sometimes, they even write about themselves. In this experience, you will learn about a type of story called personal narrative. Storytelling is a great way to keep a memory alive. Think of a funny, embarrassing, or important memory you have. Write a brief description of that memory and why it is memorable to you. Share your response with a partner. What you just wrote is the beginning of a personal narrative. In your own words, what do you think a personal narrative is?